In my review of Sugru I mentioned that it would be great if it came in primary colours, which would give you yellow and reds and allow you to mix almost any colour. Well they must have listened to me. 🙂 Announced today, it’s now available in packs of 8 x 5 gram packs of red, blue, yellow, black, and white, or a pack of black and white, or a pack of black only. Only “issue” is that the price for the colors has remained the same ($15) as the original 12 packs, so it has gone up in price. Similarly the black and white packs are the same price but you only get 8 packs instead of 12 ($17). 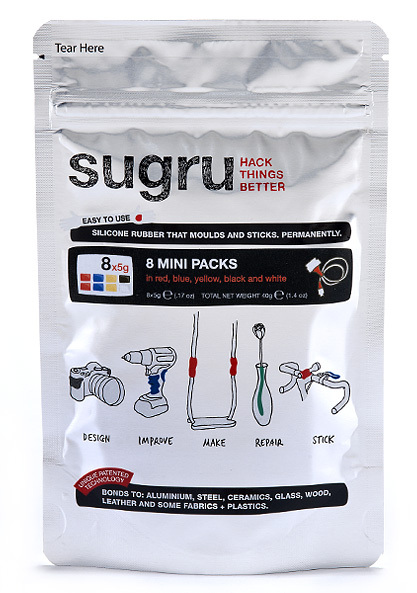 If you’re interested you can buy direct from the Sugru online page. The multi-colored mini packs are great for me as I only need a little at a time.